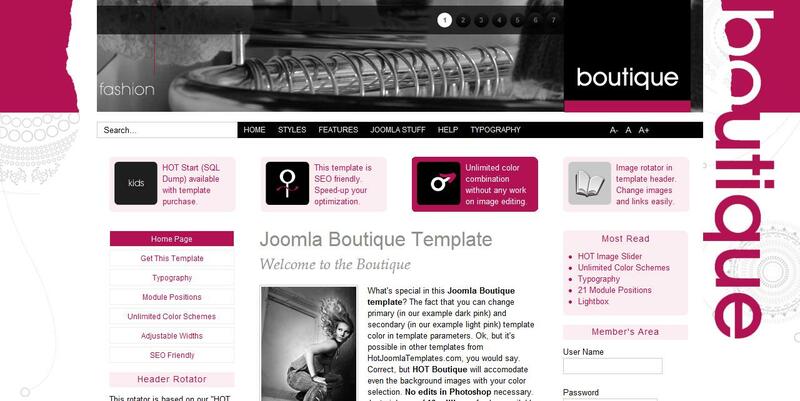 HOT Boutique - stylish template from the team HotJoomla for sites running CMS Joomla 1.5 and 2.5. Flexible and convenient control panel allows you to edit the template, all visible elements of design layout and color scheme to define a template. Possible settings: type speaker positions, setting the background image, customize the background color is possible to set one of the 5 color styles, and adjust the width of the sidebars. This template has a high speed of loading pages and also has a folding modular design. In the installation package includes studio expansion: HOT Image Gallery, HOT Joomla Carousel and HOT Joomla Gallery, which provide dynamic display relevant images on the site.